Is it fair to target Mahendra Singh Dhoni? MS Dhoni is the father figure of the current Indian team. “Goalkeeping is a job where you are a hero and a villain at the same time. People will not remember how many times you saved the team but will always remember the time you conceded the goal regardless of what happened.”- Iker Casillas. The job of a goalkeeper is a thankless job. No matter how many times that keeper saves the team but his one mistake can change the complexion of the game and from being a hero that player will become the villain of the club that too in the same match. If you still wonder whether the above premise is false or not; try thinking from Loris Karius point of view. He was the number 1 choice goalkeeper of the Liverpool but his mistake in the UEFA Champions League final against Real Madrid was good enough to replace him at the club. Not only in football but also in other sports the keeper of any team is the main component, the “think tank” of the team, he can sense what is coming and knows where they should be headed for a victory. One such keeper is Mahendra Singh Dhoni, also known as Captain Cool. He is truly the goalkeeper of the Indian Cricket Team. A keen observer, an astute thinker and a clinical finisher; hang on a minute! What! A clinical finisher? Is he really the ‘finisher’? A big question to worry for the Indian team as the experts say about him nowadays especially knowing the fact that 2019 ICC Cricket World Cup is a few months away. There was a time when India was assured of the fact that no matter how many runs the team required there is always one player to absorb all the pressure and will take the team home irrespective of where he is coming out to bat. Nevertheless, in the darker stage of twilight, this player is not the same as he used to be. He is unable to finish the game and is now becoming a “burden” on the team. Is he becoming one? Burden or not who knows! However, things were different in this year’s IPL. We, as an audience, saw a reimagined MS Dhoni. He was striking the bowlers for big sixes, was mastering the art of chase again and more importantly was giving himself at least 10 to 20 balls before pressing his killer button. But why is it that he is not able to the same thing for India as he was doing it for his franchise in the IPL? He himself has said in an interview that before the auction he simply commanded his team management that,” I cleared myself to the management. I told them that I want a team which bats deep so that I can be the aggressor and can bat up the order so that even if I get out then there's a chance for others to see off the game.” If the franchise management can understand this then why can’t the Indian team do the same with him that too at the international level? For a cricketing nation like India where talent is ready at the disposal, the team has not been able to find its permanent number 4 and number 5 batsmen. There is a muddle in the middle for sure! Despite all this, the veteran player is still asked to bat at number 6 or 7 as the management feels it is the right position for the player to be in. But does this thought belongs to the management or the captain? There has been a very big role of the captain of the team in the performance of MS Dhoni. 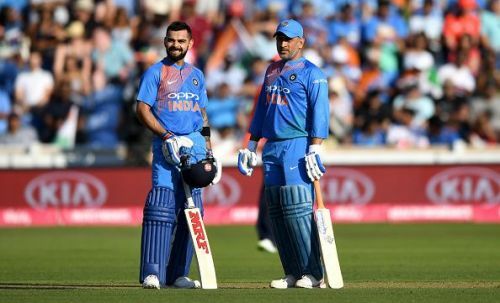 Virat Kohli who has said in the past that for his team, MS Dhoni is going to bat upfront which possibly can be number 4 yet there have been very rare incidents where the veteran was pushed up the order to play with both overs and runs in abundance. Manish Pandey, Ajinkya Rahane, Yuvraj Singh, KL Rahul and Dinesh Kartik all of them have been tried and tested by Virat Kohli and the result of such an experiment has been the same; nobody performed and had found their way out in some way or the other. Howbeit, the question is why is Virat Kohli so reluctant to play MS Dhoni at number 4? No one knows the answer to this question as the team is still to witness MS Dhoni coming at the top of the order in the reign of Virat Kohli. The reluctance of Virat Kohli is taking a toll on Dhoni's confidence. If there is someone who has properly utilised the services of the maestro as a batsman then it has to be Rohit Sharma. In the two tournaments he took the charge of the team which also involved MS Dhoni, he clearly mentioned that no matter what the situation is; the batsman at number 4 is going to be MS Dhoni. Such a clarity of thought and the manoeuvre to carry out the process has brought out a different version of Captain Cool. He has been able to bat deep with the lower order and has been able to make useful contributions which have turned out to be huge in the context of the game. This thing has certainly helped MS Dhoni. The pressure is less on his shoulders and even if he fails then the players like Hardik Pandya or Kedar Jadhav are able to see the game through. Rohit Sharma has used the potential of Dhoni to the best extent. If batting position was to be kept aside then the player has provided some meaningful contributions to the team. Be it in terms of the game or be it an attractive contribution on the scorecard, the veteran has done it all post 2017 ICC Champions Trophy. Although his poor performance in England was something which gave the critics a chance to raise their voices on the player's future and his position in the team. Anyway, there is nothing to hide the fact that the old stager has accumulated more than 700 runs in a calendar year and that too when he was made to bat lower down the order. But who cares about facts and figures when the player is giving the detractors a chance to spice up the matter by questioning his inclusion in the team, isn't it? His recent failure in the ODI series came on the back of a solid performance against South Africa. Despite that when the team played the Asia Cup, the virtuoso was again at the end of fault-finding notwithstanding the fact that he has provided meaningful contributions which were big enough to deny the opposition a chance to win the game. Apart from this, if one is to go by the year-wise statistics of MS Dhoni then he has been among the chief contributors in the middle order even when the top contributions for India has come mainly from the top order batsmen. With 788 runs last year, MS Dhoni proved that he’s still got what is required from a professional player. Year wise stats of Mahendra Singh Dhoni. However, statistics may or may not support a player as it is the case with Hardik Pandya but he is a handy player when the situation demands him to be and MS Dhoni is no exception. Amid all this, VVS Laxman and Virender Sehwag both criticised MS Dhoni for his poor performance in a match against New Zealand but this time Virat Kohli spoke out in his defence saying the team management will not get influenced by statements of people who are watching the game from far. He said, “ Firstly, I don't understand why people are only pointing him out. I am not able to understand this. If I fail as a batsman even if it is three times then no one is going to point a finger at me because I am not over 35. He is contributing for the team in every possible way he could. " As Wilhelm Steinitz said, “ I may be old but I can bite someone’s hand off if he puts it in my mouth”. And the same is with MS Dhoni. He can kill the opposition alone if he is given the time and batting position which Rohit Sharma has trusted him with. Moreover, patience and trust from the fans is something which is required at this point of the moment. But the question is- Do we really have the patience to allow someone of this stature the time he needs? “When someone is down the weak comes out and speaks about it. It takes courage to speak about someone when they are on top.” -Virat Kohli (after the final test against Australia in Dharamshala).